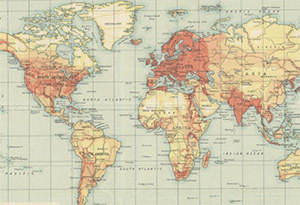 The Times Survey Atlas of the World (1920) was the first Times Survey Atlas with maps prepared by the Edinburgh Geographical Institute of John Bartholomew & Son Ltd. It included 112 colour maps (each measuring 42 x 55 cm., on sheets 46 x 59 cm.) all specially compiled for the Atlas over the previous 5 years. Following an initial General Section of world and thematic mapping, the maps are grouped into five main geographic regions, as listed below. We are very grateful to David Rumsey and Geopast for assisting with the georeferencing of these maps.